Safety and Security – Is Ibiza safe? However, in the peak summer months, like every other popular tourist destination in the world, the crime figures rise as the island fills up. We are very happy to say that only a tiny proportion of the 10,000 clients we bring to Ibiza every year are unfortunate enough to experience any form of crime. However, we would obviously prefer that none of our clients experience any sort of negative experience or loss of possessions while they are on holiday on the island. We are constantly looking at ways to protect clients staying in our villas. We put many new measures in place for 2017 to ensure the safety of our guests during their occupancy. However, crime during the summer is not limited to thefts from holiday accommodation. It is really important to be aware of any risks while you are out and about on the island, the same way you would in any busy holiday destination in the world, or any major city at home. We have put together the following information and guidelines to inform you of the risks and how best to prevent them. DO NOT BRING EXCESSIVE AMOUNTS OF CASH OR VALUABLES WITH YOU. Use Travellers’ cheques or debit cards and only cash in or withdraw small amounts at a time. If you are planning on using a debit card, ask your bank to set up an adjoining account, set up online banking, then split your holiday funds between the two accounts. If you do lose one of your cards (never carry them both at the same time!) you can transfer the funds into the other account, meaning you won’t be stuck without access to money. DO NOT GIVE DETAILS OF YOUR ACCOMMODATION OR YOUR SOCIAL ARRANGEMENTS TO ANYONE YOU DON’T KNOW. DON’T INVITE ANYONE YOU DO NOT KNOW BACK TO YOUR HOLIDAY ACCOMMODATION. In the summer months many ad-hoc ‘concierge’ agents set up business on the island offering the delivery of club tickets, drinks, services etc to villas. Should you decide to purchase club tickets, or any products or services from any third party agent, we cannot stress strongly enough, that you should arrange to meet them elsewhere and not invite them to your villa. Bear in mind; if you buy tickets to a club night from an un-registered ticket agent, you have just given them a very clear idea of when your villa is going to be empty! BE AWARE OF YOUR BELONGINGS WHEN OUT AND ABOUT IN RESTAURANTS, BARS AND CLUBS, OR AT THE BEACH. Busy beaches and crowded social venues the world over, are a favourite hunting ground for pick-pockets and opportunist thieves. Don’t take valuables or loads of cash to the beach, particularly if you’re a fan of long swims or long sleeps! In clubs and bars keep your belongings close to you at all times, and be aware of people randomly bumping into you or trying to distract your attention. SECURE YOUR ACCOMMODATION PROPERLY WHEN GOING OUT. This one really is a no-brainer, but you would be amazed how many times members of our team have turned up to a villa, and no one is in but windows and sometimes even doors are left open. Or everyone is asleep around the pool at the back of the villa but the front of the house is wide open. The same rule applies; if you wouldn’t do it at home, don’t do it here! ENSURE YOU TAKE OUT A VALID TRAVEL INSURANCE POLICY BEFORE YOUR HOLIDAY. Don’t leave it to chance and hope it won’t happen to you. Accidents happen, thefts and petty crime can occur. Make sure you are adequately covered for medical expenses and loss of personal possessions. Whilst some private hire companies are fine, Ibiza – like many tourist destinations – has been plagued with the problem of illegal taxis. The cars are sub-standard, the drivers are not police checked and many come from dubious backgrounds. It is not uncommon for villa renters to experience robberies or attempted break-ins after using illegal taxis. If you do make the mistake of taking one of these taxis, make them drop you down the road – never back to your holiday accommodation, and – under no circumstances – discuss your plans for the week, however friendly and chatty the driver appears to be. The best solution, if you are not hiring a car, is to only take public transport, legal taxis or licensed people carriers. See our page Villa Taxi Service page for more information. 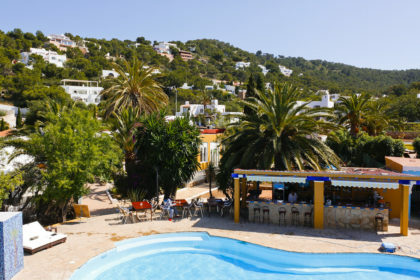 Ibiza is generally a really safe and friendly place to enjoy your holiday, and has a lower crime rate than many other parts of Spain. Staying safe in Ibiza is really only a matter of common sense; not bringing vast amounts of cash or valuables, using the safety deposit boxes provided for smaller items, passports etc, and securing your villa properly.